The V200FF incorporates a unique “fail in last position” IP converter module that compared to other IP converters will remain in last position if the power (signal) is lost. Most electropneumatic positioners will go to zero if the power is lost and the pneumatic output will default to one of the ports of the positioner (on the V200 it is the C- port) – this will drive the valve/actuator in one direction. The V200FF, on loss of power, actually “locks” the air in place due to the unique design of the IP module. This means the valve/actuator package will “fail in place” and won’t move until power is restored. Under normal conditions the V200FF operates like any other electropneumatic positioner. Common applications for this product are dampers but it can be utilized in other critical applications where fail safe systems are desired. 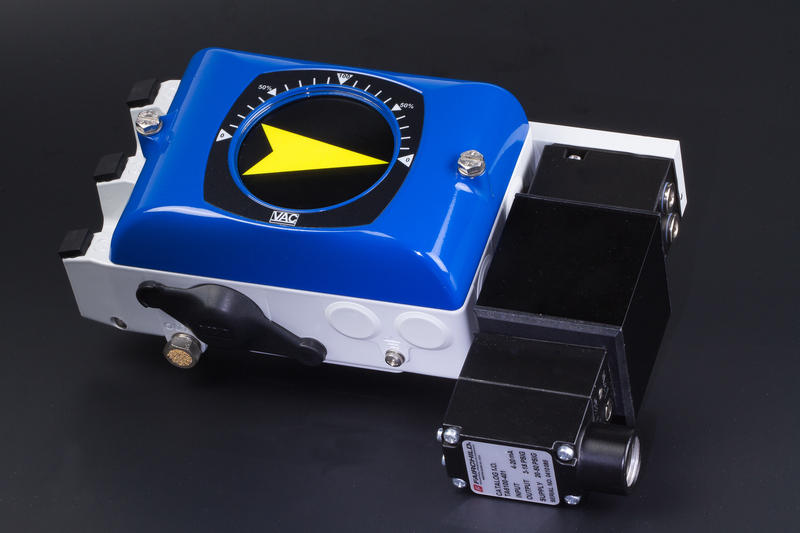 The pre-calibrated external FF IP is mounted to the V200P base positioner with a short adapter plate and uses the actual supply air pressure, filtered through a specially designed filter. The I/P converter then converts this pressure via an electrical signal to a 20-100kPa / 3-15psi signal back into the positioner signal diaphragm chamber for mechanical positioner response. It accepts the traditional two wire, 4-20mA input signal and is available for use on rotary or linear applications. Standard features like the external zero and span adjustment makes this positioner very user friendly for calibration and maintenance. The large indicator has scaling to operate in both direct and reverse directions. With the unique snap in drive shaft design the unit can be used for versatile mounting to various actuator applications including rotary or linear actuators. The gauge block is cast into the unit and therefore standard. Options like special cams, dome indicators and more are available. The FF IP converter is available as a spare module which gives the flexibility of specifying the V200FF anywhere between the factory and the field.